Paddle up the Rocky River and you’re immersed in a vacation world of million-dollar homes and jaw-dropping yachts. Slender steel gray townhouses. Bright blue-and-white cottages. The homes of Lakewood’s Clifton Lagoon, where garages open directly onto the water. And mansions high up on the cliffs. Homes hidden from the hustle of the street, you can see from the river, with their three-story decks and docks piled with stand-up paddleboards. Swivel your head to the other side and you can see the docks of the Cleveland Yachting Club: massive cabin cruisers, sophisticated sail boats, speedboats with punny names. And all over are kayaks, paddleboards and boaters waving hello. 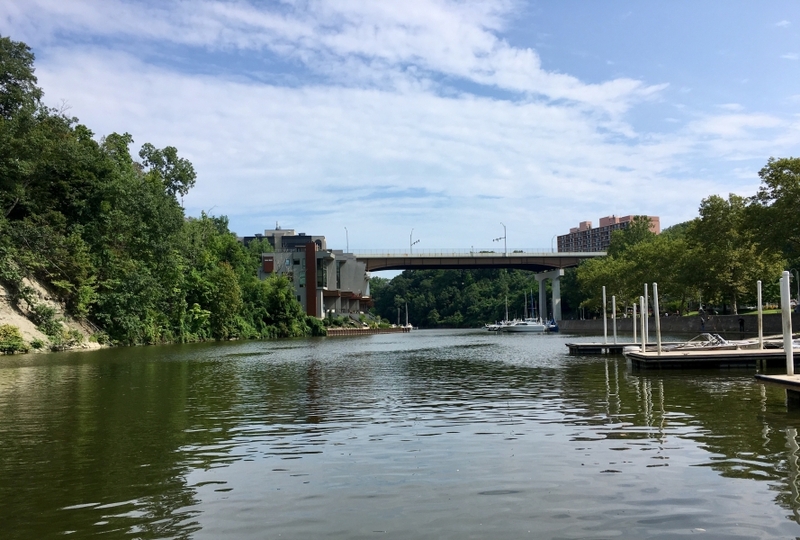 I took my best friend on a tour of the Rocky River, beginning at the Cleveland Metroparks’ Emerald Necklace Marina, up to the green-and-white striped lighthouse, with a glimpse of the private Clifton Beach before heading back around the yacht club. You can check out our photos in the gallery above. Plus, you can take your own tour, renting a kayak or paddleboard at 41 Degrees North at the park.